This is a comedy program about making a music video. The program features well known comedy artists. Starring: Jitu Nepal, Daman Rupakheti, Kedar Ghimire, Sitaram Kattel, Anju Maharjan, Ishan Raut(Jire). Comedy video collection of the 2015 edition of Nepali comedy festival Gaijatra. Various comedy and satirical music videos in the following collection feature the interviews of fake politicians and parody songs. Comedy – Goru Farm is a Gaijatra 2015 presentation by Om Sai Records. The program includes poems, hot music videos, interviews and satire programs. The program is written by Daman. Camera by Man Raj Shrestha, editing by Rajendra Manadhar / Rabindra Bhatta. In the crowd of comedy serials, one more comedy serial is going to be added in Nepal Television (NTV). Popular comedy director and actor Daman Rupakheti is bringing a new serial named ‘Hakka Hakki’ on every Saturday at 8:50 PM. The serial will make fun of the social problems, superstition and other issues. The serial is being written and directed by Daman. Ti is going to feature Raju Comedy (Narayan Baje of ‘Dittha Sab’), Kabita Sharma, Radha Shrestha, Sujit Thapa, Kamala Regmi, Ram Thapa, Raju Bhuju, Maniraj Kafle, Umesh Kumar KC, Rajan Chaulagain and others. The serial is managed by Umesh Kumar KC and produced by Ram Thapa. Who is Sangam Rai, Lovely of Meri Bassai and Jhayaikuti Jhyai ? 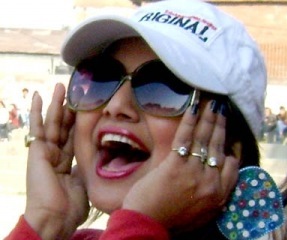 Comedy actress Sangam Rai is popularly known as the character Lovely in ‘Meri Bassai‘ and ‘Jhyaikuti Jhyai’. The character Lovely of Daman Rupakheti had been a very popular character in the comedy serials. Sangam was absent in the industry for about half a year when she went to Malaysia to study Hotel Hospitality course. The real name of Sangam is Chandrakala Rai. Thinking that the name wasn’t glamorous enough, Chandrakala changed it to Sangam. Sitaram Kattel (Dhurmus of ‘Meri Bassai‘) is popular for copying CPN (UML) leader KP Oli. Ghanshyam Gautam – is popular for being featured as CPN (UMaoist) leader Puspa Kamal Dahal ‘Prachanda’. In the past, Manoj Gajurel was also featured as Prachanda, Madhav Nepal, ex-king Gyanendra and other leaders. Daman Rupakheti – popular for being Sher Bahadur Deuba. Kamal Kant Mainali – is known as fake Madhav Kumar Nepal. Pradeep Silwal is featured as Sushil Koirala. And, the journalists lost the match! A friendly football match between Nepali journalists and comedy artists was organized in a playground in Sano Gaucharan, Kathmandu. The match was one of the matches being organized for Box Office Foot League 2067. In the match, the comedy artists won the game against journalists with 4-2 score. The goal scorers from the journalist team were Suman Karki and Shreehari Thapa who score one goal each. In the comedy artist team, Manraj Shrestha and Chiyong Gurung scored two goals each. The comedy artist team was lead by Dipakraj Giri and the team included Deepak Raj Giri, Deepa Shree Niraula, Sitaram Kattel, Kedar Ghimire, Daman Rupakheti, Purna Thapa, Gopal Dhakal, Manaraj Shrestha, and Chiyong Gurung. The journalist team comprised of a team of Dipendra Lama, Suman Ghaire, Uttam Gaudel, R.K. Subedi, Manaraj Shrestha, Bikash Karki, dinesh Sitaula, Suman Karki, and Shreehari Thapa. The journalist team was led by Dipendra Lama. This year, there will be two groups of Gaijatra comedy show in Kathmandu. The group of Jhayikuti Jhayi and Bhuichalo will be conducting a show at Rastriya Shaba Griha and another group composing of the artists of comedy shows Tito Satya, Jire Khursani, and Meri Bassai will perform in Pragya Pratisthan. But, both the programs are organized by Universal Event Management. Rampam Jhayikuti Bhuichalo will feature Daman Rupakheti, Rabi Dangol, Purna Thapa, Shekhar Khanal, Palpasa Dangol, Manju Shrestha, Surbir Pandit etc. Shrigrams Royalstag Jire-Meribassai-Tito Satya will feature Jitu Nepal, Shibahari Poudel, Kiran KC, Kunjana Ghimire, Gopal Nepal, Manoj Acharya, Kedar Ghimire, Sitaram Kattel, Rajaram Poudel, Nirmal Sharma among others. Daman Rupakheti has turned 35 on Sunday, July 11. Daman was the Concept maker of Meri Bassai who later left the popular tele-serial to make a new comedy serial, Jhayikuti Jhayi. Daman had recently returned from Malaysia where he had done a stage program. He went to Malaysia with his partner Sekhar Khanal, where he had also shot some parts of Jhayikuti Jhai. On his birthday Daman told, “I have eaten 35 pinda.” In Nepali, pinda is a food offered yearly by the son of the deceased during a special memorial ceremony.